posted by Lisa Ace in Sponosred post, advertisement, red osier, anniversary, specials, fine dining, food, Stafford. posted by Lisa Ace in Sponsored Post, advertisement, alex's place, Easter, food, dining, specials, batavia. Celebrate Easter at Alex's Place! We will be offering our full dinner menu along with great Easter specials. Reservations are being taken for parties of all sizes by calling 585-344-2999. Open noon to 8 p.m. Click here for Easter Specials. posted by Lisa Ace in Sponsored Post, advertisement, alex's place, Rib night, Prime Rib & Steak, food, dining, specials, batavia. Breaking News -- Alex's Place is announcing two weekday specials that are sure to beat the winter blues. From now 'til May 1st, join Alex's Place for Prime Rib and Steak Night every Monday and Tuesday. Enjoy a Prime Rib or Strip Steak dinner for two for just $29.99, includes 2 steak dinners, 2 sides, and 2 salads. And Wednesdays are now Rib Night, featuring $10 half racks and $15 full rack of everyone's favorite Baby Back Ribs. Click for more info. posted by Lisa Ace in Sponsored Post, advertisement, batavia's Original Chicken Wings, specials, Wild Wing Wednesday, Wings, food, Batavia's Original Pizza. posted by Lisa Ace in Sponsored Post, advertisement, Eli Fish Brewing Company, New Year's Eve, food, Dinner for two, specials, batavia. Are you looking for something to do on New Year's Eve? Come spend the night with Eli Fish! We will be offering a special New Year's Eve Dinner for Two menu from 4 to 8 p.m. with desserts provided by Eden Cafe. Genesee Ted will be performing starting at 9:30, and we will bring in the New Year with a ceremonial keg drop and the tapping of a new brew -- BRUT-ally Honest IPA. Click here for more details. posted by Lisa Ace in Sponsored Post, advertisement, alex's place, Restaurant Week, food, specials, Alex's. 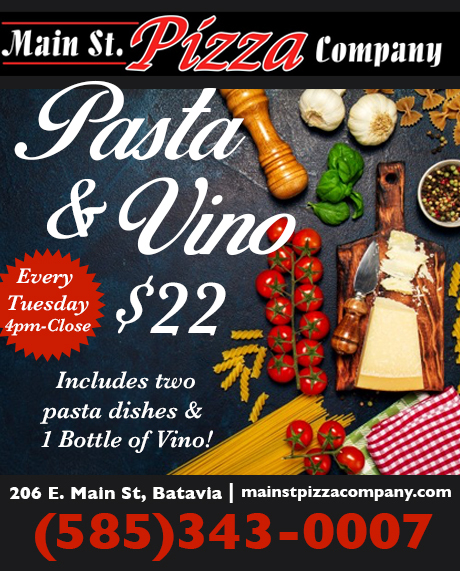 posted by Lisa Ace in Sponsored Post, advertisement, main st. pizza, Pasta & Vino, specials, food, batavia..
posted by Lisa Ace in Sponsored Post, advertisement, main st. pizza, Pasta & Vino, specials, food, batavia. posted by Lisa Ace in Sponsored Post, advertisement, batavia's original, food, father's day, specials, batavia. 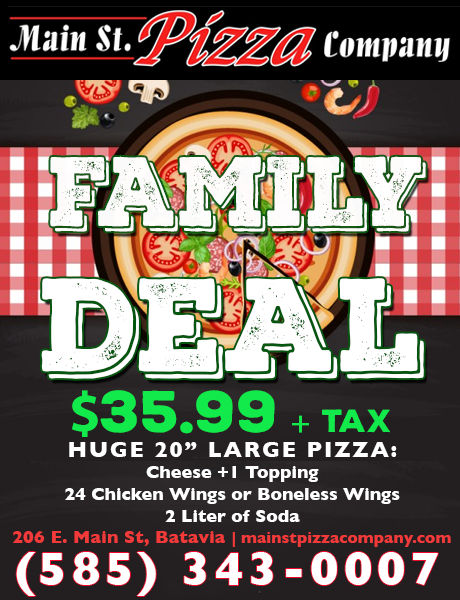 posted by Lisa Ace in Sponsored Post, advertisement, main st. pizza, Family Deal, specials, food, batavia..